"The education system here humiliates lots and lots of kids." During the recent Late Late Show, economist David McWilliams joined Ryan Tubridy on the couch to talk about his new book, Renaissance Nation. Aside from discussing the changing social dynamics of Irish society and the rise of the so-called 'sliotar mom,' the topic of conversation turned towards the Leaving Cert curriculum. As stated previously, we're firm believers that social media posts about how the Leaving Cert doesn't matter miss the mark because while the examination process is flawed, it's still an essential part of the process which allows Irish people go on to third-level education. This in turn can shape their future careers, incomes and lives. This being said, there's a plethora of stories - and you'll know plenty of people like this - of adolescents that didn't do the Leaving Cert and they've gone on to have incredibly 'successful' careers and happy lives. 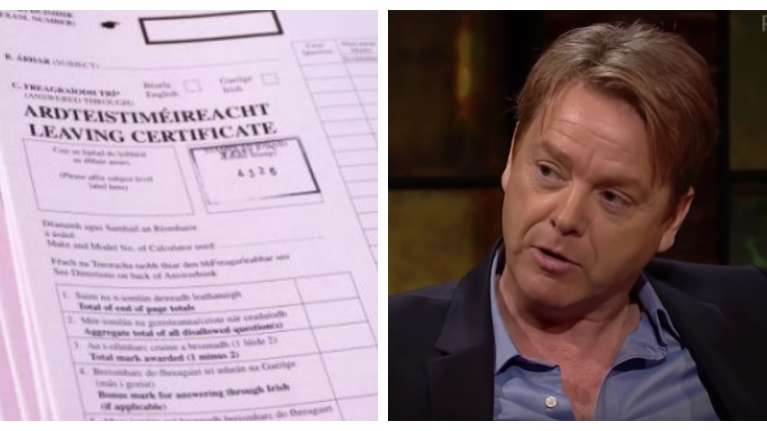 Granted, the measure of success is relative, but the Leaving Cert examination process can be flawed. For example, it's entirely possible for a student to not apply themselves for almost two years in school. When the Leaving Cert is approaching, these students can just cram for the final six months of the cycle and do quite well in the exam. Essentially, the Leaving Cert can be beneficial for anyone with an incredible memory because they're able to furiously jot down essays, facts and data in the exam. That's a talent, but what about concepts like critical thinking, deductive reasoning, and independent thought? Here's what McWilliams had to say on the issue: "I think the Leaving Cert and the education system here humiliates lots and lots of kids. It rewards only a certain type of intelligence and as we get older, we realise that the world is full of amazing people with different abilities. They're all clever and intelligent but in school, we reward only one type of learning." He adds: "Consequently, what happens is that there are thousands of children that feel humiliated every day. Can you imagine what it's like going into school when it feels like a small humiliation? How frustrated would you get because your brain works laterally? As you get older, I've met so many people that are unbelievably clever and they left school in Ireland feeling really stupid. This is a tragedy. I believe the Leaving Cert needs to be reformed and school needs to be a bit more like life." These comments from McWilliams resonated with plenty of Irish people.